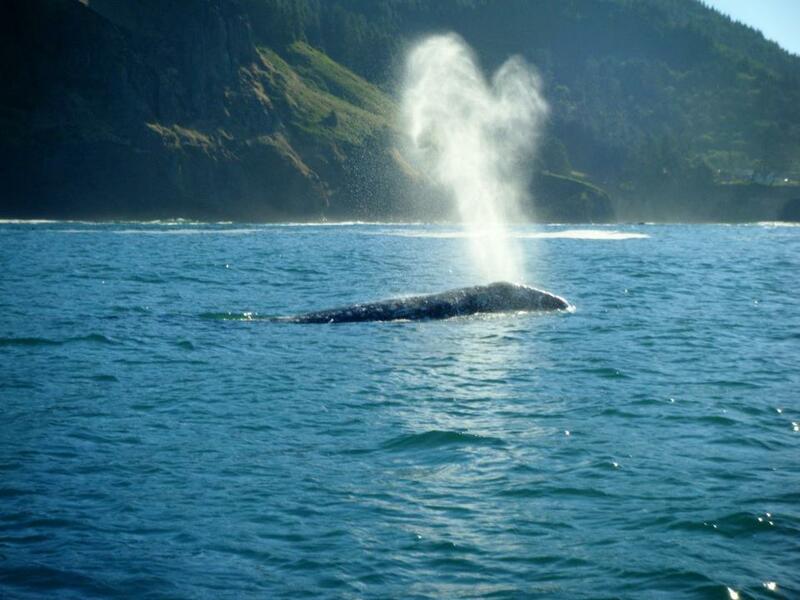 A small percentage of gray whales feed off the coast of Depoe Bay between May and October. One of their primary food source is mysid shrimp, which swarm in abundance near the ocean bottom and around the kelp beds. The gray whale does not usually feed during its migration or winter calving periods. On occasion they will eat shrimp like mysids or small fish at the surface. They can lose up to 30 percent of their body weight between feeding seasons. When they feed they swallow mouthfuls of mud from the bottom, and then use their baleen as a filter. This leaves the amphipods stuck to the baleen inside their mouths. They then use their tongues to loosen the amphipods from the baleen, and swallow. The blubber they add during the summer feedings provides energy for the remainder of the year. Some whales can go without food for 3-5 months. Gray whales are noted for their protective behavior toward their calves. They were once called “devil fish” by early whalers. Now they are considered the “friendliest” of whales, often curiously approaching whale watching boats. When a gray whale comes to the surface, its blow or spout is a double-plumed, a misty jet of vapor, rising 6 to 12 feet. The blow is not a fountain of water, but a mist of condensed air exhaled under high pressure from the lungs. The whale can expel 100 gallons of air in a single blast. Generally, gray whales are slow swimmers, averaging three to five mph during migration and have a rhythmic breathing pattern. Normally they will make three to five short, shallow dives of less than a minute each and then a long, deep dive. A general rule is one short dive and a blow for every minute spent in a deep dive. This repeated breathing pattern enables the whales to store up oxygen and get rid of carbon dioxide built up during a long dive. In a single breath, 80 to 90 percent of the air in their lungs is exchanged. Feeding dives may range from 3 minutes up to 15 minutes; they can stay under water for 30 minutes. If they are frightened, they can hide on the bottom or travel great distances underwater. Sometimes they dive and reappear a quarter of a mile away. Whales have the largest brain of any animal on earth. They are curious and often seen “spy hopping”, or lifting their heads above the surface of the water. They like to rise up and get a better look at their surroundings. When a gray whale lifts its tail flukes out of the water, it is going into a deep dive. This action, called sounding or fluking, helps propel the whale downward to the bottom where they feed on small crustaceans. After the flukes disappear under the water, the turbulence of the dive will cause a circle of smooth water, known as a fluke-print. The ultimate in whale sightings is a breach, which occurs when a whale launches as much as ¾ of its body out of the water. Scientists are not sure why whales breach. They speculate that they do it to remove parasites, communicate with each other, or just do it for fun. Young gray whales along the Oregon coast seem to breach more frequently. Gray whales can reach a length of about 40 to 50 feet, and weight between 50,000 to 80,000 pounds. They can live up to 40-60 years, some 70 years. Just like people, once they reach middle age, they seem to get a little fatter. The gray whales have a double blow hole, most of the older grays have scars and tooth rake marks from encounters with Orca Whales (Killer of Whales). The dimples on the young calf’s are where you can see the baby’s facial hair. This dimply shortened face is characteristic of all young gray whales. A lot of times the calves will poke their heads out of the water to get a better look at us whale watchers. Whales are mammals, they breath air, have hair (calves have hairs around the front of their heads). They are warm blooded, and give birth to live offspring that suckle milk from their mothers. The gray whale is in the sub-order Mysticeti family. The Mysticeti whales have a baleen instead of teeth. The male gray whale can reach 45 feet, while the female’s can reach 50 feet and weigh 30 or 35 tons. The largest gray whales have flukes, (tails) that can span ten feet. While they are in the Northern waters, the gray whales feed mostly on tiny shrimp like amphipods. There are ample amphipods in the Northern waters during the summer because the longer days create more phytoplankton and zooplankton. Gray whales are the only bottom feeding whale; the amphipods that the gray whale feeds on live on the bottom of the ocean. One gray whale is believed to turn about 50 acres of sediment during a season of feeding. The mud that is churned is oxygenated, and exposed to the nutrient rich water. Which is then seeded for the next year’s harvest. When gray whales feed on the bottom 90% like to use their right side to scour the bottom and find their food.